To change things up, this week I’m posting a pic from Eric & Josh’s teenage years. Eric is second from the left, and josh is the one in the pink fuzzy hat. This week’s podcast is a fun one. Season 5 has a lot of boring crap in it, but Sleeping Arrangements is actually a fun episode with 3 good story lines and only one stinker. 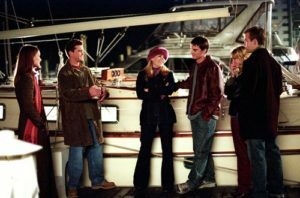 The main plot revolves around Pacey being offered a job to sail to Greece and the drama that leaving behind his friends, and newfound mentor drums up. Plot 2 is that all is not well in D-Jen town, as the honeymoon is over, and they struggle to make it as lovers and room mates. Plot 3 is Jack finding his place at his new frat where he realizes that, although most are accepting of him, one in particular is a bit of a douche. And finally the plot that could have been left out is that Joey is thinking of getting with some hair-helmet weirdo and who cares. 75% good is not bad for 5th season, so we’ll take it! Hope you like it as well. Visit our sponsor Seize the Memes of Production and use the promo code “CREEK” for 10% off your order.